(First Prime Minister of the State of Israel, 1886-1973). 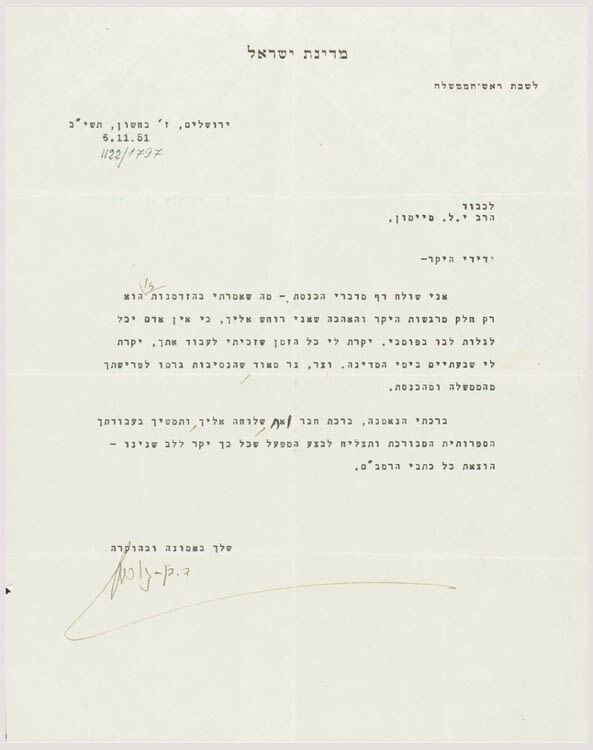 Typed Letter Signed, in Hebrew on Prime Minister’s letterhead, to Rabbi Y.L. Maimon (Fishman). Filled with lavish praise: “I am sending what I said in the Knesset. It contains only part of my feelings of esteem and affection that I have for you. For a person cannot reveal his heart in public. The time that I merited to work with you is very dear to me. Especially during the early days of the State. It pains me that circumstances have forced your departure from the Knesset. May you continue your literary work especially the writings of Maimonides.” One page. Rabbi Yehuda Leib Maimon (1875-1962) was a prolific scholar and leader of the Mizrachi Party. He served as Minister of Religion of the State of Israel from 1948-61.